For determining the project management system of the year, we subtracted the popularity scores of January 2017 from the latest scores of January 2018. We use the difference of these numbers, rather than a percentage, because that would favor systems with a tiny popularity at the beginning of the year. 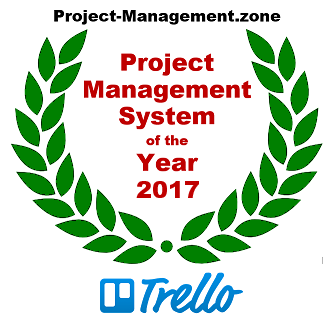 The result is a list of project management systems sorted by how much they managed to increase their popularity in 2017, or in other words, how many additional people started to communicate about it in one of the ways we measure in our methodology, for example job offers, professional profile entries and citations on the web. Trello is a Kanban-inspired task management tool that is loved by its users because of its outstanding user interface and its limited, but well-focused feature set. Many competitors try to build an "improved Trello", but with limited success so far. They either don't quite match the user experience, or they add features that make sense in principle, but that add just this little bit of complexity that irritates some of its users. The fact that Trello manages to keep gaining popularity is a sure sign that they firmly occupy a sweet spot in the project management systems landscape that many people find to be ideal for a large range of projects. Smartsheet is a project management tool supporting more traditional approaches to task management, such as tabular sheets and Gantt charts, but not without adding its own unique twist in the form of an interactive spreadsheet-like grid view user interface - hence the name. This well-established data entry paradigma obviously works very well also for project management users. Asana focuses on simplicity and flexibility with an emphasis on delivery over planning. That may sound abstract, but the goal to enable effective team cooperation is certainly much appreciated by its users. Asana is on the way to establish itself as post-email application for smaller teams as well as on enterprise scale. We congratulate Trello, Smartsheet and Asana for their success in 2017. The three winners have a few things in common. They are all web-based and well-suited for small to medium-sized projects. They put more focus on ease-of-use rather than a complete implementation of some project management methodologies. Perhaps most important, they support project management as a team effort, rather than a project manager working on its own on the great plan, and then telling everyone what to do. That does not mean that full-fledged project management tools are suddenly obsolete, but for a large range of projects it makes sense to avoid their complexity. This project management trend is well reflected in the measurements of our ranking.